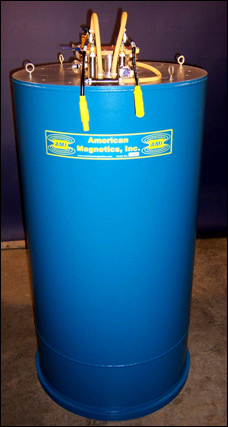 Bottom loading magnet systems are typically used when a small diameter (e.g., 8 inches or less), top-loading sample insert is to be used and the magnet is relatively large. The magnet is installed from the bottom of the dewar through a series of bolted flanges and installed on the bottom of liquid helium reservoir. This allows the dewar neck diameter to be small, thus minimizing the liquid helium consumption. Bottom loading systems can be used with solenoids, split coils, gradient coils, etc.